Today's APOD is an Extra Detail Magnification (or "EDM", for short) obtained from yesterday's extraordinarily beautiful Contextual Image (or "CTX Frame", for short) of the Dwarf Planet 1-Ceres, taken at an oblique viewing angle (as to the Surface) by the NASA - Dawn Spacecraft on January, 4th, 2016, that showed us an interesting couple of Impact Craters. 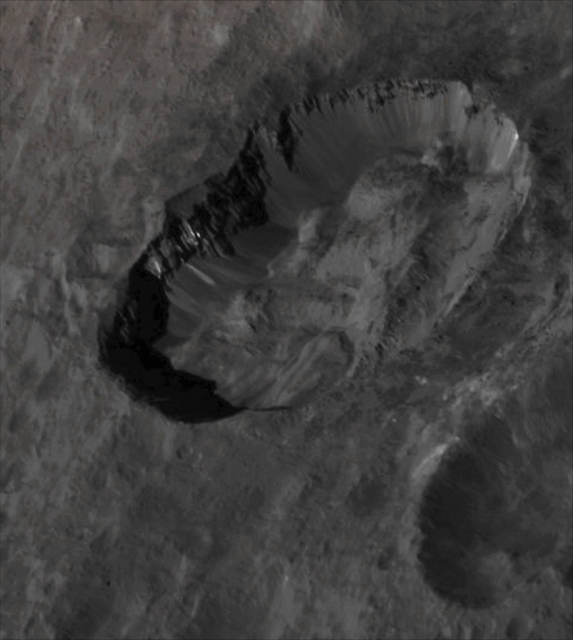 The larger one is - most likely - slightly oblong in shape, and known as Juling Crater; it is roughly 12 miles, such as about 19,312 Km, in diameter. Juling Crater displays, as you can see here VERY well, prominent Spurs of Compacted Material along its Outer Walls (which is a further evidence that the Original Impact that formed Juling must have occurred at a relatively low angle). More Material has obviously fallen down from the Edges and Walls until it filled the Crater's Floor with large Mounds of Debris. The presence of delicate Features - like the aforementioned Spurs and Debris' Slides - indicates a (Geologically speaking, of course) young age for Juling Crater, because such details easily erode over time, thus generating a smoother appearance. White, bright (and, so far, unknown) Material can also be easily seen on the East-facing Wall and Slopes of Juling Crater. The Original Frame was centered at about 33,6� South Latitude and 168,7� East Longitude. The NASA - Dawn Spacecraft captured the scene during its Low-Altitude Mapping Orbit (or "LAMO", for short), from an approx. altitude of 227 miles (such as about 365,320 Km) above the Surface of 1-Ceres. The Image Resolution is roughly 138 feet (i.e. about 42,062 meters) per pixel (---> Picture Element). This image (which is a crop obtained from an Original NASA - Dawn Spacecraft's b/w and NON Map-Projected frame published on the NASA - Planetary Photojournal with the ID n. PIA 20386 - DAWN LAMO Image n. 32) has been additionally processed, extra-magnified to aid the visibility of the details, contrast enhanced and sharpened, Gamma corrected and then colorized (according to an educated guess carried out by Dr Paolo C. Fienga-LXTT-IPF) in Absolute Natural Colors (such as the colors that a normal human eye would actually perceive if someone were onboard the NASA - Dawn Spacecraft and then looked ahead, towards the Surface of 1-Ceres), by using an original technique created - and, in time, dramatically improved - by the Lunar Explorer Italia Team.